Associate Vice President Ken Creehan accepts the "Award of Excellence" from Webster Groves Mayor Gerry Welch during Thursday's ceremony. Browning Hall earned two awards from the City of Webster Groves Thursday night during the “Awards of Excellence” ceremony. The University’s intradisciplinary science building earned an “Award of Excellence for Architecture” and an “Honorable Mention for Landscaping” during the ceremony. Associate Vice President Administrative Service for Finance Ken Creehan accepted the awards on behalf of Webster University. The Awards of Excellence winners are selected by members of the City’s boards and commissions and the Webster Groves Historical Society. These awards identify projects in the City that exemplify excellent design and acknowledge the owners, designers, and builders for their achievements and contribution to the community in the areas of architecture, historic preservation, landscape architecture, and craftsmanship. The awards have been given out 15 times in the past 18 years. Webster University previously was recognized in 2005 for the restoration of Loretto Hall, 2007 for the Emerson Library and in 2014 for the East Academic Building. Earlier this year, Browning Hall earned the “Outstanding Designs Common Areas Award” in the Educational Interiors Showcase Edition of American School & University Magazine, and the Outstanding Projects Award” by Learning by Design Magazine. The building was recognized in 2017 for its design excellence this year by the American Institute of Architects (AIA) St. Louis Chapter. 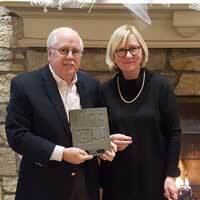 Browning Hall was recognized by the City of Webster Groves for outstanding architecture and landscaping. Cannon Design was the architect for Browning Hall and Paric Corporation was the general contractor. Spellman Brady & Company was the interior designer of the space. A grand-opening ceremony was held for the building on Oct. 19, 2017.